@Bugis | Get Your Grub On! After a very questionable fish head steamboat dinner my friends took me down Liang Seah Street for some Asian dessert. At first I wasn’t too excited but boy was I up for a surprise. This place was awesome and had a pretty similar menu to Lui Hau Shan which I learned to love so much during my last trip to Hong Kong. I was already ecstatic but the absolute kicker was that here one could order as many of those off the hook squishy glutinous rice balls as wanted. Oh yeah. I had the works; mango mousse, mango ice cream, sago, pomelo and a batch of seven awesome squishy balls. It tasted great, maybe not as great as its’ prettier Hongkongese twin but surely great enough to make me just a little happier. Cooling, fruity, not too sweet with some bitter pomelo popsicles and heapz of textures going on as well – moussy, creamy and chewy. I reckon they could’ve dropped the crushed iceberg floating in the middle, which was always in the way but I guess when you’re in the tropics you have to keep stuff cool, so no hard feelings. It was ridiculous and I was so happy to have finally found a place like this in Singapore. And obviously I wasn’t alone as it was bustling down here with a constant crowd waiting on the street for a slot to open up. It was so busy that a while after we had finished our desserts, chatting away, the staff kindly asked us to give up our seats so the next round of customers could get their sweets on. Absolutely loved it. 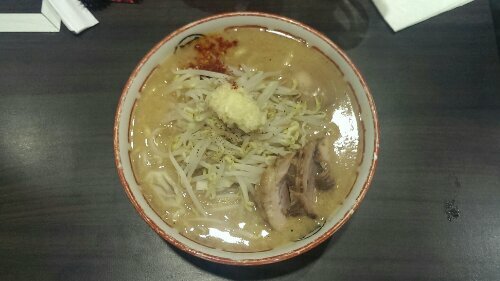 My first visit to Ramen Champion. I read about ‘Ramen Champion’ a lot but stayed rather sceptical considering the big number of very average ramen shops in Singapore. On occasion I actually saw some tempting stalls popping up and leaving again before I managed to come down here but tonight some friends and I had planned to finally try it out. Researching during the day, my choice fell on ‘Bario’ because it had that ‘Jirokei‘ or ‘Jiro Style‘ ramen that I ate only once before at ‘Menya Shinchan’ (麺屋しんちゃん) which have closed down their shop at Robertson Quay a long time ago. The bowl was massive and just loaded with stuff, heapz of sprouts that added some nice crunch and big slices of soft and smokey charred chashu that was good but not more. The thick and porky broth had an outrageous garlic punch that made my tongue feel furred and unknowing as I was, I had even added some additional fresh garlic from the freeloader station as well. “Hey again there Mr. Dragon Breath”! The extra chilli though seemed a much better idea. All this was already pretty great but what I loved most about this bowl were the noodles; they were those thick curly ones, springy and extremely entertaining to eat. All noodles should be like that. Even that they didn’t do a bad job trying to create a comic style Japanese ramen town of some sort, ‘Ramen Champion’ still has a touch canteen atmosphere to it, also because of the fast turnover of customers, vibrating order alerts and the obligatory plastic trays. Nevertheless I was very positively surprised with ‘Bario’ and might take this as a reason to give some of the other stalls here a chance to do the same.